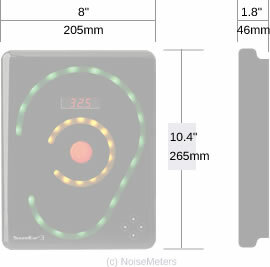 The noise warning sign and interface module can be mounted on a wall or other suitable surface. An optional adjustable VESA mount can be used for more secure or corner mounting if needed. It measures the sound levels in line with the noise measurement standards, stores the results, and makes them available to the LiveNoise Supervisor and Reporter software over your network, or to our cloud server over the Internet. An HDMI output can be used to display the live sound levels on a computer monitor or HDMI television. 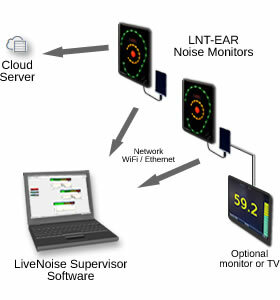 On a purely "internal" system, the noise monitor communicates continuously with the LiveNoise Supervisor software running on a computer on your network to provide real-time noise levels, long-term stored noise measurements and high-noise alarms. Using this setup there is no need for the monitors or software to communicate with the outside world. The LiveNoise Reporter software can generate reports of the noise and alarms over daily, weekly, monthly or other custom periods. With the cloud based reporting system the noise monitor uploads its measurements to our LiveNoise Server for you to view using the Web Reporter. You access this through a web browser. With this setup there is no software to run locally and you can view the results from anywhere with Internet access. The standard LiveNoise System includes both methods. You can use the Supervisor software on your local network, you can use the cloud based reporting, or you can use both at the same time. The Noise Warning Sign can be mounted on a wall using a single screw. The LiveNoise Terminal is mounted close by using two screws or it can just sit on a shelf or other suitable surface. If a more secure mounting method is needed or you want to angle the noise sign away from the wall then an adjustable VESA mount is available. An extra security bracket is also available for the LiveNoise Terminal. Please contact us for more information. A standard USB cable (included) connects the LiveNoise Terminal to the Noise Warning Sign. The system requires 5V DC, which is provided by the power adapter that is included. The noise warning sign part of the system is mounted using a single screw, like hanging a picture. For greater security a VESA mount option is also available. 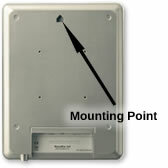 The LiveNoise Terminal part can also be wall mounted using two screws. It connects to the noise warning sign via a single USB cable (included). The LiveNoise Terminal can communicate with the LiveNoise Supervisor software to provide a real-time display of sound levels and for long-term noise measurement storage. With the Supervisor software running on a computer on your network, the LNT-EAR noise monitor just needs WiFi access or a wired Ethernet connection to the same network. If you have a WiFi network then all you need to do is provide the noise monitor with the router name and password. This configuration is carried out using the supplied software. The noise monitor has an Ethernet port (RJ45) for connection to your wired network. This is a weatherproof socket and for outdoor use you will need a suitable weatherproof cable or weatherproof RJ45 cable housing. For indoor use a standard RJ45 network cable can be used. The LNT-EAR will need to be connected to your network in order to send the noise measurements to the Supervisor software or to the cloud server, depending on your configuration. A computer on the network runs the LiveNoise Supervisor software, which shows the real-time noise levels and downloads all the measurements for long term storage and reporting. 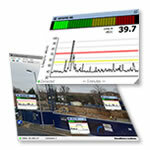 Other computers on the network can access the noise measurements using the LiveNoise Reporter software. 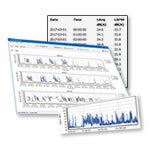 The monitors send the noise measurements to our server and you view them using Web Reporter. The LiveNoise Supervisor, Reporter and the online Web Reporter are included when you buy one or more LiveNoise Noise Monitors. With the noise monitors connected to your network, you can chose how you want to deal with a live display and with long term reporting. Supervisor - Connects to all your noise monitors, showing the live sound levels, indicating any high noise level alarms and storing long term measurements. Reporter - Using the measurements stored by Supervisor, this software generates long term noise reports: daily, weekly, monthly or custom periods. The noise monitors send all the noise measurements to our cloud server, from where the Web Reporter provides you with noise reports. 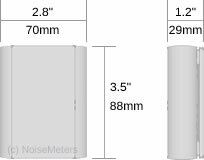 Noise Warning Sign 265 x 205 x 46 mm, 10.4" x 8" x 1.8"
LiveNoise Terminal 70 x 88 x 29 mm, 2.8" x 3.5" x 1.2"